In September 2010, revised accessibility standards Title II and III of the Americans with Disabilities Act of 1990 were adopted with the purpose of improving access by special needs persons to recreation facilities. Until the enactment of this new law, ADA access was focused on facility access, not necessarily the water portion. Covered are public and private recreation facilities, and includes both new construction and structural changes to existing facilities. Requirements for compliance differ depending upon the type and size of your facility. Regulations allow 18 months to bring facilities into compliance. What ADA Accessibility Guidelines for Buildings and Facilities – Chapter 2 - Section 242 (ADAAG – 2004) of the 2010 standards establishes minimum guidelines for swimming pool, wading pool, and spa accessibility. Who The 2010 ADA accessibility regulations apply to both public and private recreation facilities. When The revised provisions of the Americans with Disabilities Act was signed into law September 15, 2010 with a period for compliance of 18 months, with a deadline of March 15, 2012.
bringing your pool into compliance with current accessibility guidelines. Add safety and utility with deck mounted ladders, guardrails, handicap lifts, depth markers, showers, and more. 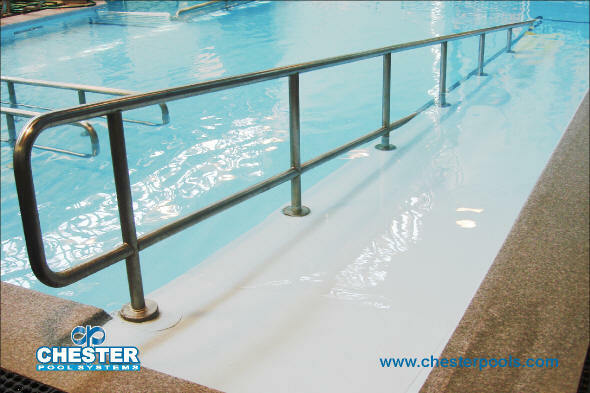 Engineered, palletized filter systems, designed for your pool, your site, and your application, factory built and tested.